Construction in GRP of Diego was started by Italy’s Econavi yard in the late eighties, but when the yard went bankrupt the build was taken over by Codecasa and completed in 1989, making her the only GRP hull to emerge from the Codecasa yard. Accommodation is for eight guests in a master suite, VIP stateroom and two identical twin cabins, while twin 1080hp Detroit Diesel engines give her a cruising range of 1,200 nautical miles. Diego has been extensively refittted and upgraded in 2008. Her interior is much better than the original with beautifully crafted cabinets and wall details. Makore wood with burl accents has been used throughout this yacht and mechanically she is in excellent condition, offering her new owner many years of safe and extensive cruising. Currently lying in Seattle, Diego is asking $1.95 million. 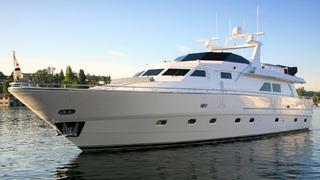 For more information about this superyacht contact.